This trail follows an old minning route that that was used to haul silver ore from Silver City To Georgetown. Although the grade is a slight incline this is a tecnical singletrack that will test your riding skills. On your bike get back on the street you drove into town on head S.W. to the 4-way intersection continue straight through the intersection cross over Clear Creek follow the street 2 or 3 blocks to Main St. a T-intersection turn left ride a short distance to a stop sign continue straight Main St turns into Saxton Mountain Road you will see the sign on the right after about another 1/4 mile you will see a sign indicating Silver Creek Trail 1/10 mile. There is no trailhead sign so look for the trail on the left at the last house just as the road starts to turn to the right. The trail takes off at the bottom of what looks like a driveway I'ts actually a road. You can see the trail if you look in the direction of the lake. The trail is about 5 miles long and ends at a 4x4 road. From here return as you came or you can connect with Dumont or Lawson by following 4x4 roads down to the frontage road and then back to Georgetown. There is also a trailhead for Silver Creek Trail just below Georgetown on the frontage road. Look for it just after you cross over Clear Creek on the right just past the driveway. Review: As an intermediate rider I can say I this this trail is more advanced or expert level. 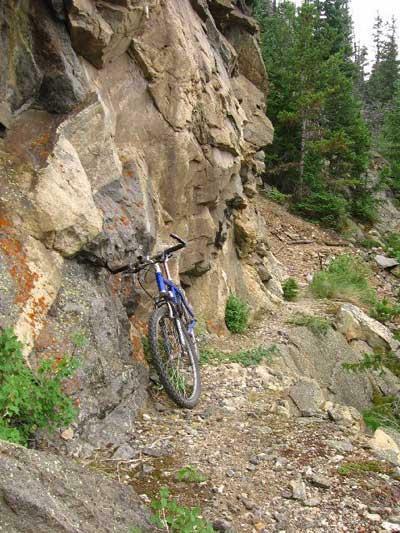 Most of the trail follows a thin mountain ledge and a mountain wall. One mistake can be deadly. Trees are fallen and some of the trail is out from a land slide. One family, whom were hiking on the trail to a lake, were surprised to see a person on mountain bike. I did manage to complete the trail and take the road back to Georgetown, but there were lots of parts I had to walk my bike. Review: Pointless? I thought it was fun: somewhat techy, beautiful area, and although you are next to the highway, the sound somehow decreases. Similar Trail: nothing: that's one reason it's cool. Similar Trail: Hopefully no one has spent time or money building anything similar to this. Review: This is a very fun ride and especially great for someone on a single speed. The trail winds quickly through the trees and has a ton of cliff exposure that requires the rider to pay attention constantly. It would be better if it was a little longer and had some climbing/descending, but it is still some really fun riding. Silver Creek Trail MTB Trail 2.00 out of 5 based on 4 ratings. 4 user reviews.